Wow this past week has definitely brought some excitement to all our guests at Leopard Mountain with all of the Big 5 being seen up close and some spectacular sightings of Cheetah; let’s not forget about the smaller creatures of the bush with their ability to amaze. Chase was following Lions while they do their territorial rounds watching them scent mark and bond with each other before the night’s activities, Dylan shortly joined the sighting after enjoying sundowners, we continued to follow the lions to a nearby dam and watched them enjoy their own sundowner drinks for the evening. Leopard activity has been abundant this week with their tracks around every corner and the sneaky Hyena’s in close pursuit hoping to chase the leopard off their kills. Dylan and Donald tracked Hyena down one evening into the riverbed and found a big female casually going about her business. A Leopard female was seen by Chase and the Parsons, a group of friends out from the UK, this elusive cat gave us an amazing sighting as she sat out in the open for everybody to view. 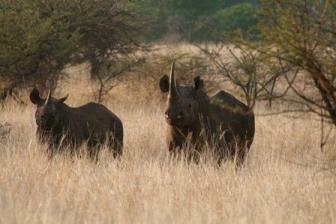 Elephant, Buffalo, Black and White Rhino sightings have been incredible. An Elephant herd came out of the thicket and surrounded the vehicles. They were so relaxed that a baby decided to take the gap to suckle right in front of us. The rare Black Rhino on a couple of occasions has come merely meters from the vehicle with the guides themselves saying, “It’s been some of the best sightings they’ve ever had”. A Cheetah male has been very active this week with some females in the area he’s constantly on the move, one evening after having a close encounter with a black rhino we set off for a sundowner, this shortly changed as we were alerted to some impala alarm calling close by so off we went to investigate. We came across a male cheetah with a kill; he’d just made a real special sighting and to top it off some buffalo were moving into the area while we watched him. Some other specials on the smaller side, have been watching the majestic Marshall Eagle trying to hunt baby ostrich but with no success due to the father’s protection. 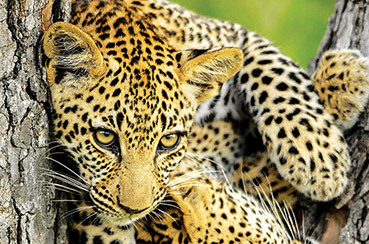 Porcupine, Genets, White-tailed mongoose, Slender Mongoose, White faced Scops Owls, and Crocodiles have all added to the beauty of being out in the African bush.